You may have noticed that recently an ad cropped up on the sidebar for a website called LinguaLift. Normally we don't do much advertising around here, but that's mainly because I've decided to try and keep any JADJ content related to Japan or learning Japanese. When I received an advertising request from LinguaLift, I accepted knowing that they (a) are a Japanese learning service and (b) have been around for a while, though under a different name. That said, I do want to put it out there that the advertising is paid, but this review is not. First off, I'd like to say that while if you skip to the end I do recommend this service, that is qualified. I think some people would benefit from this a lot more than others in its current form, as I will explain. If you are interested in this review, please consider the fact that learning is a very personal thing and I can only review this from my own perspective, colored by my own experiences and Japanese study history. For this review, I'm going to first present an overview of LinguaLift and its features, along with my thoughts and impressions, and then at the end I'll tie it up with some miscellaneous closing thoughts and a bottom line. I'm also including Joe's thoughts. His own "Japanese path" has been very different than mine and so I think his feedback may be especially valuable to those who are studying or looking to study Japanese with little to no formal Japanese language education. 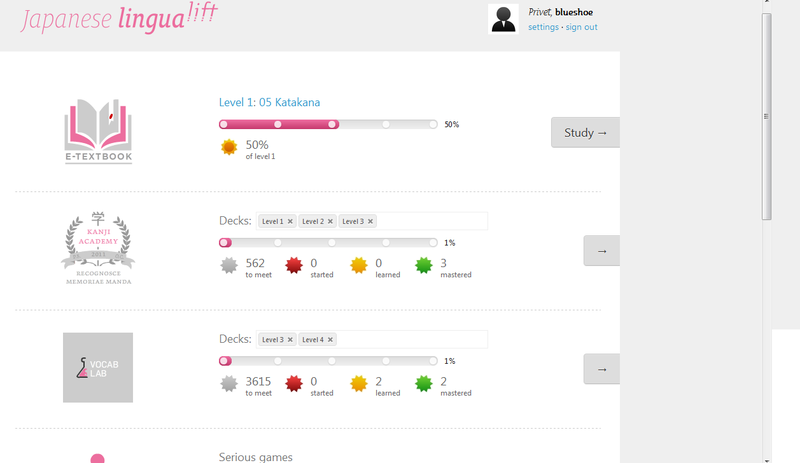 LinguaLift is a web application for students and self-learners which will guide you on your way to mastering a foreign language, and to teach you how to learn efficiently while having fun at the same time. Subscribers have unlimited access to a wide array of custom-built applications—such as the E-Textbook, Kanji and Verb Academy, Vocab Lab, and the Frenzy game—each focusing on a different aspect of language acquisition and retention, ensuring a holistic approach to your language learning. I think that sums it up pretty well. LinguaLift is an online study kit that contains a series of tools for learning/strengthening different aspects of the language. As of now I believe Japanese is the only language offered (and the one we're reviewing), but the site notes that more languages will be available in the future. LinguaLift is browser-based, which means that you must be connected to the internet in order to use it. Pricing is $29 for a month, $145 for 6 months (1 month free) or $261 for a year (3 months free). Compared to TextFugu, which is probably its largest competitor, this may be a little steep (TextFugu is $20 a month or $120 for a lifetime subscription), however I can't speak comparatively as to the content of TextFugu. Jumping into the LinguaLift interface, there are currently 4 different tools: an E-textbook, Kanji Academy, Vocab Lab, and Arcade. And then they insert 'The Japanese Tradition' clip from youtube. I'm starting to think these are men after my own heart. I just got to the learning hiragana part. It's kind of strange they didn't just give a list of all the hiragana and say 'learn these'. It feels like they're just stretching everything out. It'd be nice if they had some sort of flash game to help learn the kana. They don't really need all those pages of text describing what kana is. That's not really helpful in learning it." I also felt that some of the material is a bit academic, which isn't really a good or bad thing but depends more upon the learner. For example, one of the early lessons taught me the difference between morae and syllables. While I think it's extremely easy to learn Japanese without knowing the difference between the two (or rather not being able to vocalize the difference, perhaps? ), it is interesting, especially if you happen to like linguistics. The pacing of the lessons is quite nice, though. As Joe noted, there are some videos and pictures interspersed throughout the text. If they could add some simple flash activities or games in the future, I think they might really have something unique. One other nice feature is that the text includes a Rikai-like tool that displays reading and definition information when you hover your mouse over a kanji. Moving on, the Kanji Academy is a neat little tool that introduces you to various kanji along with common compounds that employ them, and then gives you little questions to help you learn and review the ones you've seen. A nice way to learn perhaps, but I couldn't find a way to skip through kanji I'd already learned - if I said I knew them, they would just be added to the set of kanji I would be given in review questions. Not a problem for those who are just starting out, but potentially a nuisance for those who aren't. At least there is a way to roughly set your level, however. At the moment it doesn't appear all of the Joyo (daily use) kanji are available. The Vocab Lab allows you to select the levels you want to test (1-4) and then presents you with new words in a fashion similar to the Kanji Academy. In general, these two tools remind me of Anki and I think could be of real value to those willing to dedicate the time to really using them. It did occur to me that intermediate to advanced students would probably benefit from studying Japanese in Japanese, a feature not (yet?) offered in these tools. "Japanese Frenzy is a pretty cool game. I like the music. I wish you could do it with Kanji too. I'd actually play that, if I had to type in the readings." Agreed - with some kanji, I think this game would really be appealing to higher level students, as well. One thing that struck Joe (and me as well) is that there is in the LinguaLift interface, right below whatever tool you're using, a bar for feedback. Additionally, there is a "Contact us" button that indicates when a staff member is available to chat. Ollie Capehorn, one of the site's founders, kindly made himself available and answered some questions I had about the future of the service. Without getting into specifics, it does appear that the developers do have a lot of ideas for improvements and updates are in the works. One thing he mentioned is that there are several new games for the arcade that are slated to be added to the site by the end of the year. At the moment, it seems to me that most of the material is geared towards new and low-level Japanese learners and that intermediate and advanced students would probably benefit more from other investments. That said, upcoming updates may change that. There are some features that I would be interested in using if I felt the material was at my level, and I think Joe felt the same way. So in terms of personality, service, and user-friendliness, I'd like to give LinguaLift a 5/5. If you are a Japanese beginner and are willing to dedicate the time and money required to advance at independent study, I think this is a great tool. In light of the fact that intermediate and advanced students probably won't get much out of it at the moment, however, I need to give it a qualified 4/5. I may update this review in the future if we have a chance to try some of the new features and updates as they are released. 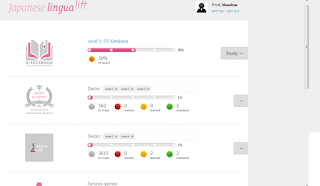 If you're interested in checking it out, once again, here is the link to LinguaLift. Firstly, thank you for your review. Your clear, open and honest comments are much appreciated, especially as they are backed up with examples to support the statements made. Secondly, from my brief trial of LinguaLift I agree that it doesn't have the usual feel of a 'language course', they do have something different in their style. The hover-over explanations, etc. are also a nice touch as is the more human interaction and contact. I'm still evaluating if the higher cost compared with other facilities can be justified - I'll let you know. Mainly wanted to say thanks for the nice review, which has been helpful.